#UNMASKTHETRUTH:TAKE THE CHALLENGE AND CHANGE YOUR LIFE. Collectively Free’s objective with the #UnmaskTheTruth challenge, like Projections Towards Compassion, is defy the culture of speciesism on a community, rather than just an individual level. Since the event will occur in public spaces, people will have the opportunity to engage collectively. The challenge is also meant to encourage activists to use electronic devices such as tablets and laptops to bring the voices of the animals to the streets, subways, etc. The #UnmaskTheTruth challenge is a powerful alternative to Projections Towards Compassion. Tablet, laptop or any other portable electronic device that can play videos. A video to play. Contact us and we will send you the footage. A looping app for the video (check the FAQ for details). 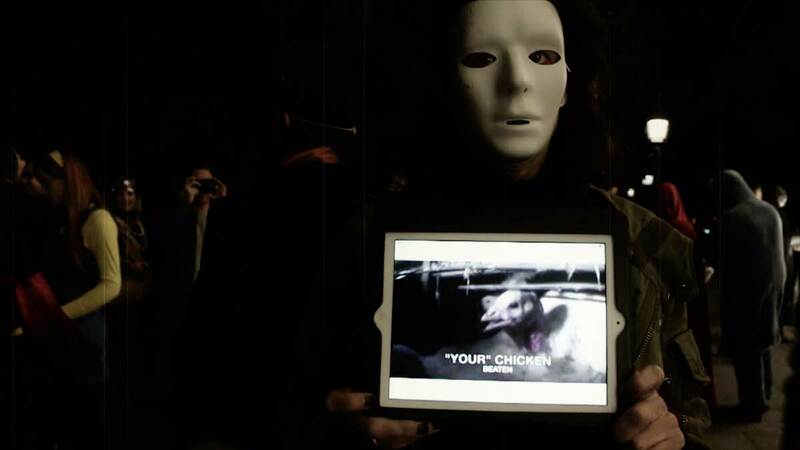 The masks reinforce the erasure and invisibility of animals and helps the spectator connect with the video before a faceless activist. Try it! Yes! Download our 1/4 page literature and have designated people to engage with passersby. Activists in mask should remain faceless and invisible. What footage do you use? Contact us and we will send you the footage. How to loop a video? Hit the button by the play button that looks like an arrow going in a circle. Your video will now loop! Open the video in Quicktime. Go to the “View” menu at the top. Import the video footage into iPhoto on your computer. Put the movie in its own album in iPhoto. Plug your iPad into your computer and sync your photos to it. Make sure that the new album is selected and the “Include videos” box is checked. Go to your “Photos” window and select the new album. Then hit the “Slideshow” button. Download Video Looper from the Google Play store. Follow the prompts to install and run it. Be sure to select the video that you want to loop.